The Guyana Citizens” Initiative for Flood Relief,(GCIFR), is now in its third day of operation. It has been established by a small group of professionals to contribute to the national response to the disastrous flooding that has dislocated the lives and livelihoods of over 200,000 citizens in the scores of villages along the Guyana’s capital and coast. In matching needs with resources, the GCIFR has over the past three days, established links with community-based organizations, NGOs, the private sector and professional organizations. These links can assist the coordination efforts and responsibilities of the Government, the United Nations agencies, the donors and others who are allocating and have allocated human, financial and material supplies. GCIFR has established a data and information system- the objective of which is to compile precise data on affected villages, communities and wards. Its purpose is to assist in the speedy identification of suffering human beings whether they be families, women, pregnant and/or lactating mothers, children, the aged or the infirm. The system and its data and information is also being made available to the designated government agencies such as the Joint Operations Command (JOC), headed by Colonel John Lewis and the Civil Defence Commission (CDC), led by Colonel Chabilall Ramsaroop. 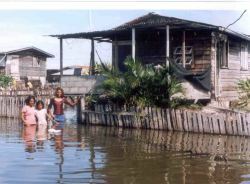 The overall objective is to act as a clearing house for the NGOs and community-based organizations whose reports on their life-saving and other activities in the communities can be used to build a comprehensive database that will provide a total picture of the disaster areas and their particular needs. In this regard, the GCIFR is calling on all organizations active in the communities to register with our technical team based at the third floor of the Demerara Life Building at Robb Street. These efforts are aimed at avoiding duplication between the needs of the communities and the local and international donors. The GCIFR has established a close working relationship with the United Nations Disaster Assessment and Coordination team (UNDAC). It is the intention of the GCIFR to publish a regular bulletin of the activities of the various organizations so that the efficiency of the relief operations can be improved by greater coordination and transparency. The Initiative is coordinated by Major General (Rtd) Joseph Singh and includes Mr Bert Carter, Mr Hugh Cholmondeley, Ms Jocelyn Dow and Dr Rupert Roopnaraine. Among the volunteers comprising the technical team are Dr. Raquel Thomas, Ms. Sharon Ousman, Ms. Gina Arjoon, Dr. Desrey Caesar- Fox, Mr. Adrian Cholmondeley, Ms Vanda Radzik, Ms Amlata Persaud, Mr Daudi Husbands, Denise Boodie, Sharon Ousman and Patrick McAndrew.